Elvis Presley (acoustic guitar, vocals), Scotty Moore (electric guitar), Hank Garland (electric & bass guitar), Floyd Cramer (piano), Bob Moore (double bass), Boots Randolph (saxophone), The Jordanaires, Charlie Hodge (backing vocals), D. J. Fontana, Buddy Harman (drums). Elvis Is Back ! now on 180 gram translucent blue vinyl, pressed at RTI ! Mastered by Friday Music's Joe Reagoso ! 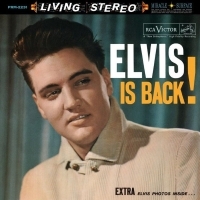 A limited edition 180 gram blue vinyl reissue of the RCA Victor classic Elvis Is Back ! by the King of Rock 'n' Roll, Elvis Presley. Presented in all its 1960 stereophonic glory ! As 1960 dawned and Elvis was finishing his time in the armed services, Elvis returned to the studios of RCA Nashville and would go on to record his first comeback dynamic rock and roll classic Elvis Is Back ! Ever proving that he was indeed on top of his game, the amazing album featured a dozen of his most rock & rhythm and blues workouts ever captured on wax like the hits "Such A Night" and more rockin' fare such as "Reconsider Baby", "The Girl Next Door Went A Walkin'" and of course the definitive classic interpretation of "Fever". The LP soon went on to achieve gold status and become one of his most important titles in his huge arsenal of masterful albums.